I’m looking forward to the month of June, the month Emma was born. 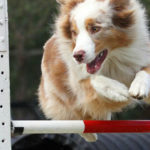 She will be 4 years old, with 2.5 years of agility seasons under her belt. I am feeling hopeful after this latest trial. It felt like we made some improvement in specific areas that have been very challenging for us. It seems like many people struggle with challenges that boil down to ‘at home’ behavior versus ‘at trial’ behavior. How many times have you watched a team struggle with table performance, weaves, contacts only to hear them later say their dog does these things perfectly at practice. I struggle with that too. Emma’s confidence and ability to execute obstacles accurately and at speed at home is truly beautiful. But at trial, she’s hesitant, cautious, anxious and refuses some obstacles altogether. It’s the struggle I’ve been working on with Emma for over a year now. 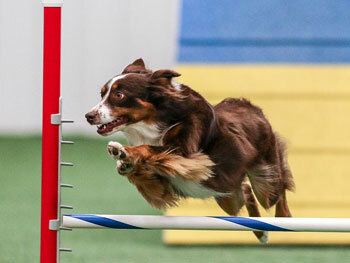 I’ve never participated or trained in any sport before dog agility. Because my girl Emma is the most amazingly athletic pet I’ve ever owned, I want her to be able to show her true ability on course. I’m so proud of her! I want for both of us to settle into a routine, to feel comfortable and confident. I want to be like all those competitors that don’t even seem to get nervous anymore. They walk their courses chatting along with their other confident friends and don’t even seem to be thinking on the course path at all. All while I’m sweating it mentally over what limited handling tools I have to execute some difficult path. I’m working so hard at staying calm and smooth so Emma doesn’t feel my own anxiety and freak out herself. This is how I am personally challenged in this sport. Some competitors have dogs that speed up when anxious. Some competitors, like me, have dogs that slow down when anxious. No doubt all can be a challenge just simply because it’s different than what’s been practiced. For me, I can’t execute a rear or front or anything new I’ve practiced if my dog won’t move along, ahead, or at any kind of speed. I have to make a whole different plan for that contingency. I also have to decide, do I continue, push through and get us both through this moment to build confidence for next time? Or do I stop and relieve her from the stressful situation? 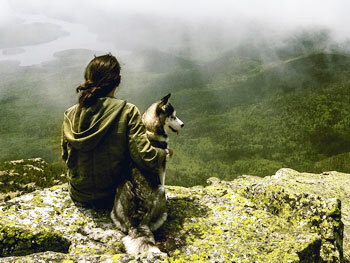 It’s my thought that only that trainer, only in that moment can make the right decision for themselves and their dog. No-one else can know what’s transpired before that moment or what efforts have already been tried. No-one else but you have all the information available to make the right choice for your team. Having said that, it doesn’t mean that other competitors haven’t experienced what you are going through. They may, or may not, have some bits of wisdom to offer you and then possibly give you the tool you need to help you with your situation. I suggest being happy for any tidbit you may gain from an experienced trainer and put it in your mental or written “Basket of Advice”. Then as you try different tactics to overcome whatever challenges you personally face, you have a pool of information to choose from when and if your current tactic doesn’t pay off. So you can see the input has been varied. Some of this is from verbal advice, some from books or videos. I have to say, there is nothing on this list or otherwise that I haven’t tried. And I can’t point to only ONE specific thing that’s helped. Rather it would likely be a combination of efforts or maybe none of those at all? It’s just possible that I didn’t need to do anything except keep training, keep trying, keep gaining confidence and also to put emphasis somewhere else besides having a perfect run. It’s my suspicion that it’s more likely that it’s my own confidence that needed fixing and not my dog. Although you can’t deny she’s had some severe ring nerves, my change in attitude about what we are there to accomplish, along with continued training to give me more tools and confidence in my own ability may very well have been the defining thing that is helping us succeed. But then again, maybe all my adjustments in routine helped too. Who knows? Practice training weaves in a different way. She already knows how to perform the obstacle very well, so I took Emma out for very short (less than 5 min each) training sessions almost daily with her breakfast and supper. Just trying to change her mindset, get her to feel weave performance is as routine as her daily meal. Trained and ask for some new tricks to our starting and finish routine: hand touches, jump up to my arms, a position between my feet and speak. I try to get these in before the “GO” so that we can be calm about it and not rushed. I try to stay out of the start line close proximity line. If the situation allows, I get up to the line closer to our turn. I think it’s my own anxiety that builds while standing around. Added as much play time in between with her favorite toys from home. She sometimes won’t engage with them, so then I switch to tasty treats. I’ve tried to be way more casual about the start line asking for tricks to get her attention off the other people around and onto me, taking her leash off earlier. I work hard to visualize the course during the walk-through so I don’t have to fret about remembering before I start, I may have to review it before stepping up to the line. But trusting my own process, that I WILL remember when I’m out there, even if I think I won’t. I’ve added marking verbally with loud cheering every time she gets her personal nemesis right, even if it’s not exactly right, but she tried AT SPEED. Added a finish line routine to reconnect with me by jumping into my arms. Trusting in my dog and the training we’ve put in, that if I do my job right I can trust her to do her job. No, we aren’t anywhere near a final stage of completely confident, 100% reliable performance. We still have a long way to go. But that’s OK, all I really need every now and then is to see some progress, that we are moving in the right direction without going too far sideways. A year of working at this has made a big difference. I was encouraged by my coach to just go back and look at last year’s agility videos. It’s a good exercise and I think I’ll make it a tradition. It allows me to see that YES, we are indeed moving forward, even if it’s mostly at an imperceptible “watching water boil”, “snail’s pace”, “plant growing” speed. I hope that you are all having progress and are able to find the magic combination to unlock you and your dog’s full potential. That’s really all I hope for, to be able to perform as a team at our best potential.